February is a cold, dreary month in the northeast United States. Like most easterners, suburban Philadelphia in my case, heading south for some warmer weather and relaxation is an appealing idea. I'm thinking about baseball spring training in Florida, but my reality will be covering the Society of Interventional Radiology (SIR) meeting in Atlanta at the end of the month. SIR is always an interesting meeting, but it's not watching a ballgame amid the palm trees. 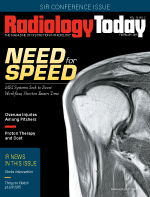 Oddly enough, there's content about both interventional radiology and baseball in this issue. Looking ahead to SIR, we have an article about adding endovascular thrombectomy treatment to tissue plasminogen activator (tPA) therapy. The so-called MR CLEAN trial results published in January (online in December) have shown better outcomes from a combination treatment than from tPA alone for treating ischemic stroke. Those results contrast with several earlier studies that did not show such a benefit. Interventionalists who support the endovascular approach see the study as evidence to support further exploration to understand when these approaches are the best option for a patient. It's sure to be a discussion topic at SIR. On the baseball side, our newest staffer Tony Fioriglio reports on a study from Thomas Jefferson University in nearby Philadelphia that looks at a possible specific cause of shoulder injuries in young and adolescent pitchers. Jefferson's Johannes Roedl, MD, and colleagues looked at how pitching overuse may lead to an incomplete fusion of the acromion and become a risk factor in shoulder injuries. It's interesting and timely stuff as major league baseball opens spring training this month in Florida and Arizona—and a choice assignment for Tony, who is our resident baseball statistics nerd (his word choice, by the way). Finally, speaking as a Phillies fan, it would be great if Roedl—or anyone else for that matter—could help the Phillies' pitching staff. February means it's time for pitchers and catchers to report to spring training and for me to report from SIR in Atlanta. So if you attend SIR, stop by booth 507 and say hello.